Maybelline is one of all time favorite drugstore brand. And so whenever they have some new launches I usually get very excited to try them out. 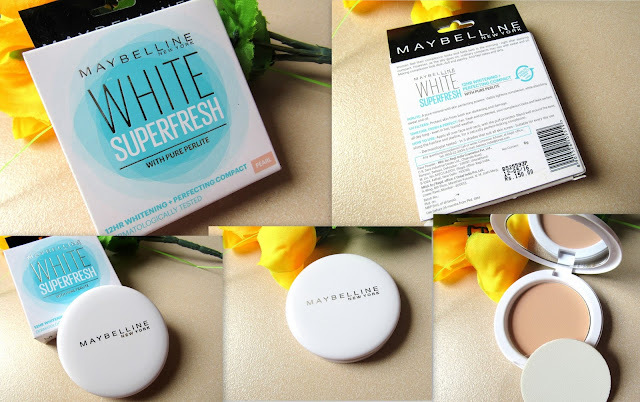 Recently Maybelline coming up with one after another some great launches in an affordable price. Most of the products in their newly launches are certainly hit in among drugstore makeup collection. 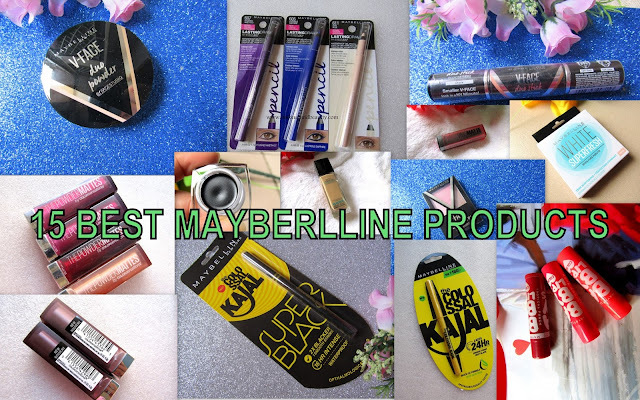 So today I am up with 15 BEST MAYBELLINE PRODUCTS. This waterproof formula infused with the goodness of Aloe Vera stays up to 24 hours without smudging. It Contains Aloe Vera.It Lasts up to 24 hours. It Does not smudge. Waterproof formula. The kajal is my personal favorite. The texture is smooth, pigmented and so it glides smoothly on the lashline. The kajal stays pretty 7 hours or more with slight fading on waterline only. SUPER BLACK With Light Absorbing Pigments, the Colossal Kajal formula delivers 2 times more blackness*, for double the intensity. For the boldest black look that enhances the natural color & shine of your eyes - in a single stroke. SUPER SMOOTH Enriched with oil for super smooth application, Maybelline Colossal Kajal glides on effortlessly and evenly, to perfectly define eyes - in one smooth stroke - while adding a rich, glossy sheen to the color result that lasts all day. 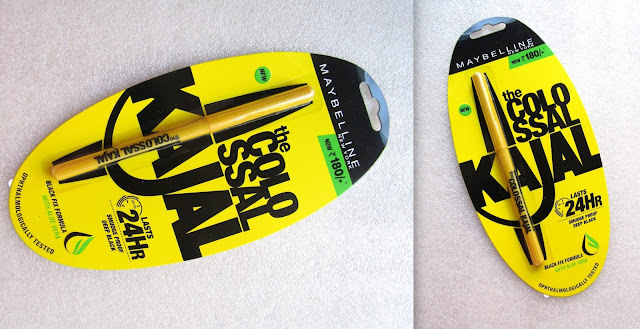 SUPER LASTING Waterproof, smudge proof formula of Maybelline Colossal Kajal stays intense for 16 hours. Ophthalmologically tested, it is suitable for sensitive eyes & contact lens users. This is the latest launch of Maybelline which is the little more better version of old one. 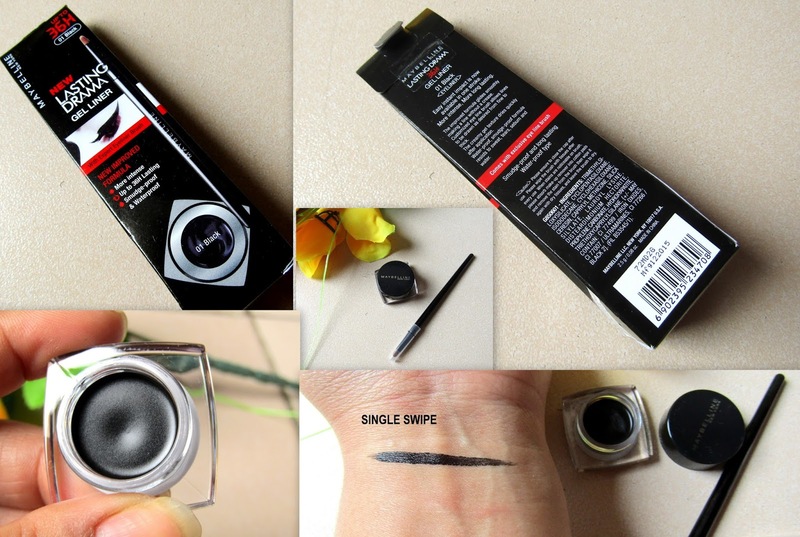 The kajal is jet black in color, super pigmented and it stays forever on my lashline and waterline. Get the precision of a liquid liner with the ease of a gel-based formula. Add some drama to those eyes! Use the Maybelline Eye Studio Lasting Drama Gel Eyeliner The eyeliner glides on smoothly and precisely, then quickly dries down to a long-wearing, water-resistant finish. A long-wearing, water-resistant, versatile eyeliner. 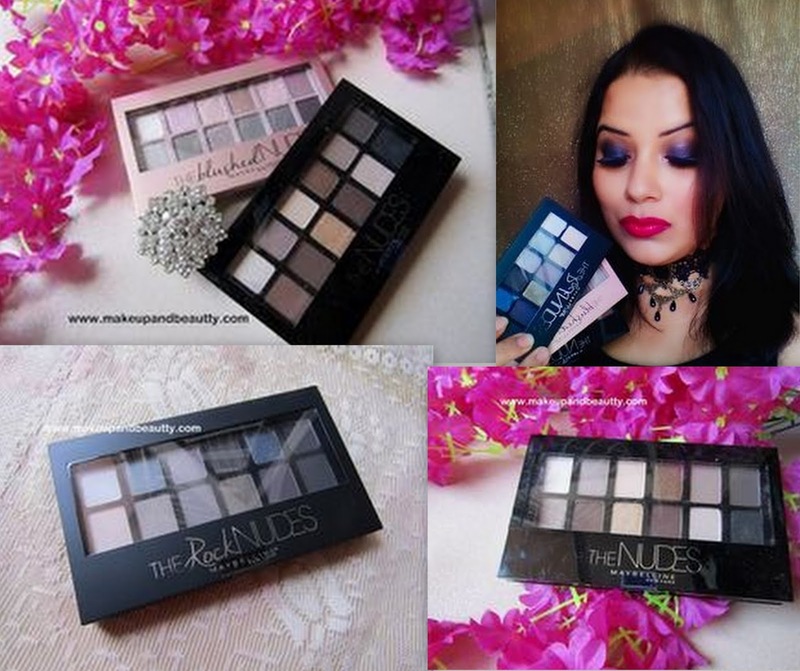 Whether you go thick, thin, smudged, or smoky, your look will last, from day to night. 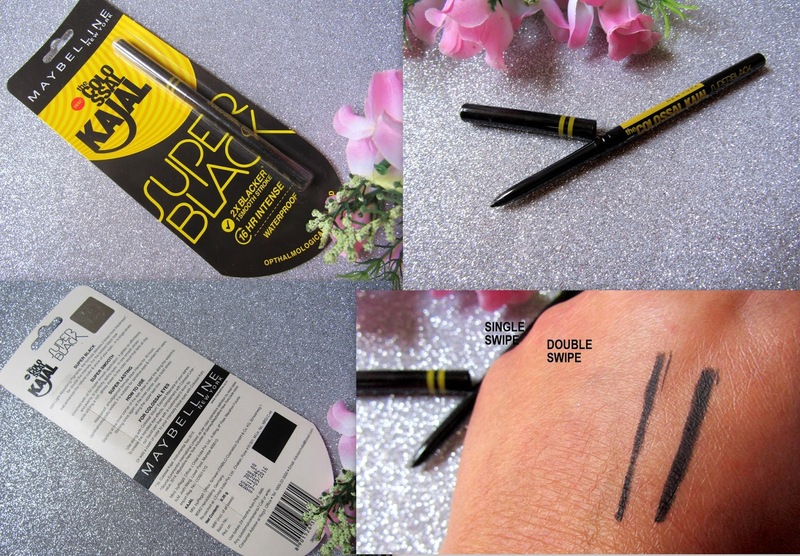 The gel eyeliner from Maybelline is one of the best gel eyeliner among drugstore brands. The gel liner comes with an eyeliner brush. The liner glides smoothly, it is pigmented. And it stays more than 7 hours at one go without any smudging. Maybelline Baby Lips Cherry Kiss perfectly moisturizes your lips and gives pink color. Comes in retractable stick which is easy to use and carry. 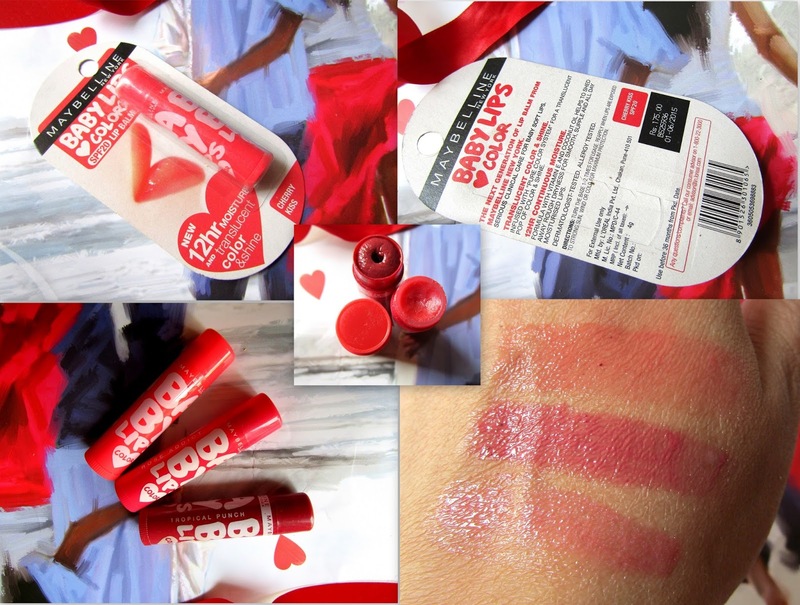 Features of the Maybelline Lip Balm. The hydration restoring formula of the Baby Lips Lip Balm will protect and moisturize your lips. Over regular use, Maybelline Baby Lips would your lips renewed. These lip balms are my all time favorite lip balms. I always go for these lip balms only when it comes to taking care of my lips. The lip balm is quite good in hydrating lips and moisturizing it at the same time. Fit Me Matte + Poreless from Maybelline New York goes beyond skin tone matching to fit the unique texture issues of normal to oily skin for the ultimate natural skin fit. While some foundations can exaggerate pores and oily skin, only our pore-minimizing foundation contains our genius blurring micro-powders that erase pores and absorb oil for a naturally matte and Poreless-looking finish. Dermatologist and allergy tested. Does not clog pores. Oil-free. Tone + texture-fitting foundation for the ultimate natural fit. Mattifies, erases pores and matches natural tone. For Normal to Oily Skin. 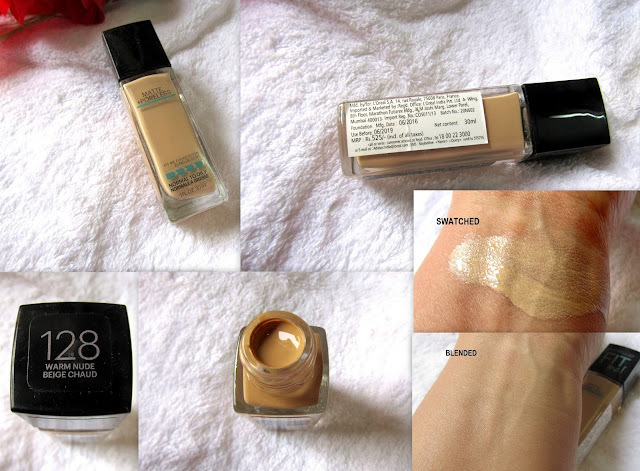 The foundation is quite affordable and good option in drugstore brands. 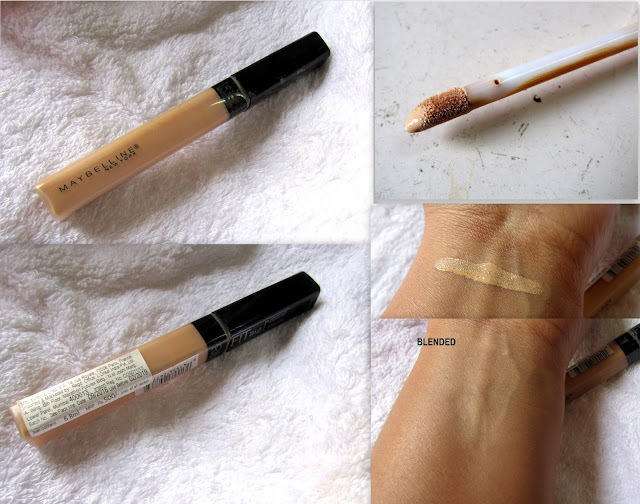 The foundation is just perfect for summer while in winter it dries out a bit. The foundation gives a medium coverage. The foundation helps to hide all the flaws of skin like pores and acne and pimple marks. Non-comedogenic, dermatologist tested, ophthalmologist-tested, fragrance-free. The concealer is one of my go-to concealers nowadays. The concealer has comfortable consistency which blends on my under eye area easily. It stays hours without any creasing. It requires a very less amount to get a medium coverage. Waterproof gel eyeliner that delivers long-lasting color. This is the best colored eye pencils I ever have in my stash at an affordable price. All the three palettes are the best option from Drugstore brand to have it if you are an eyeshadow lover. Maybelline New York White Super Fresh has UV filters that protect skin from both sun darkening and damage. Helps you stay 12 Hr Fair and Fresh. Contains Perlite, a pure mineral that helps absorbs oil and sweat. Contains SPF 28 to protect your skin. Suitable for everyday use. The compact is daily go-to compact. It gives a very sheer coverage which is just perfect for daily wear makeup. The compact is perfect for oily skin beauties mostly. It stays 4-5 hours on sweaty summers on myself. Maybelline New York presents a stunning V-face Duo Contour Powder by Face Studio that makes it easy to define, shape and highlight your features like a pro. This is a Duo Finishing Powder that highlights and contours your face easily and also sets your makeup to give that flawless finished look. Promising a 10% slimmer face and an instantly sharper nose in just a few steps, Maybelline V-face Duo Powder can be used to accentuate your features easily to achieve that natural foolproof contoured look! Suitable for all face types - square, round or heart-shaped face. The powder is a good option for those who are basically a makeup beginner. It gives a very sheer coverage in highlighting and contouring. One can use the highlight and contour powder separately or can swipe both powders together and can apply all over the face. My not so favorite but definitely can't ignore the good quality of the product. Maybelline New York presents a stunning V-face Blush Contour by Face Studio that makes it easy to define, shape and highlight your features like a pro. An all-in-one contouring and face sculpting powder blush, this gives dimension to your face with its color-coordinated blush, contouring shade and highlighter. Promising a 10% slimmer face with an instantly sharper nose in just a few steps, Maybelline V-face Blush Contour can be used to get a rosy blush look, that adds a subtle contour with a rosy satin finish. Available in 3 shades Coral, Brown, and Pink. These contouring blushes are the best blushes in pigmentation, texture, and longevity. My favorite one is pink one which look flattering on my skintone. -Maybelline New York presents the stunning V-face Duo Stick by Face Studio that makes it easy to define, shape and highlight your features like a pro. An all-in-one contouring and face sculpting duo stick, this gives dimension to your face with its contouring shade and highlighter. Promising a 10% slimmer face and an instantly sharper nose in just a few steps, Maybelline V-face Duo Stick can be used to accentuate your features with ease to achieve that natural foolproof contoured look! This one is one of the best cream highlight and contour stick in drugstore brand in an affordable price. The shade range is slightly restricted which is the only down point of this product. Otherwise a very good product for highlighting and contour purpose. Maybelline New York introduces the new Color Sensational Powder Matte lipsticks. Now powder your pout sensational with 2X Matte intensity and silkier powder finish. Get a dramatic effect with 4X saturated powder pigments + honey nectar. Ultra powdery smooth matte finish lipsticks. The intense color pays off. 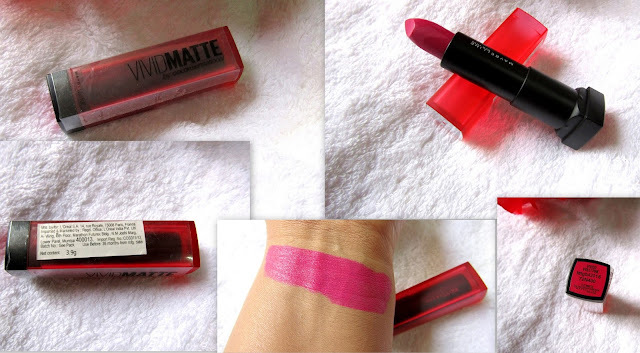 If you are a matte lipstick lover then this lipstick is just perfect for you. Color Sensational Vivid Matte Lipstick now matte comes alive with Sensational Vivid Mattes. Flaunt bright, vivid shades of matte with Color Sensational Vivid Matte Lipstick. Everyone is bound to pay attention! Apply lip color starting in the center of your upper lip. 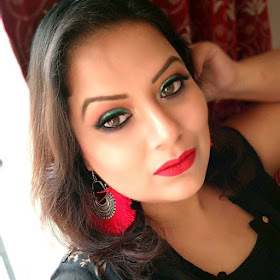 If you are looking for one lipstick which is hydrating on lips and at the same time pigmented one then these lipsticks can be your kind of choices. These are hydrating, pigmented lipsticks that stay pretty 4 hours on my lips. The texture is smooth and so it glides smoothly on lips. If you have dry lips then these lipsticks will be moisturising one on your lips. Maybelline New York introduces Color Sensational Creamy Matte Lip Color, a burst of statement-making color meets a surge of creamy texture. Achieve beautiful-looking lips and statement-making color with this supremely sensational matte lipstick. These hydrating lip colors glide smoothly and evenly on lips keeping them moisturized all day long. Now flaunt your pout in bright, vibrant and creamy matte shades for bold impact! Precious oils leave a sensuous finish. Available in 15 gorgeous hues. It is extremely light weight. Does not bleed or set into the lip lines. If you are looking for comfort matte lipsticks then you might like this range of lipsticks of Maybelline. At the end here is a video where I used most of this newly launched Maybelline products to create a look. So, that ends my today's long 15 BEST MAYBELLINE PRODUCTS. All the products are personally tried by myself so the entire post depends on my personal choice. 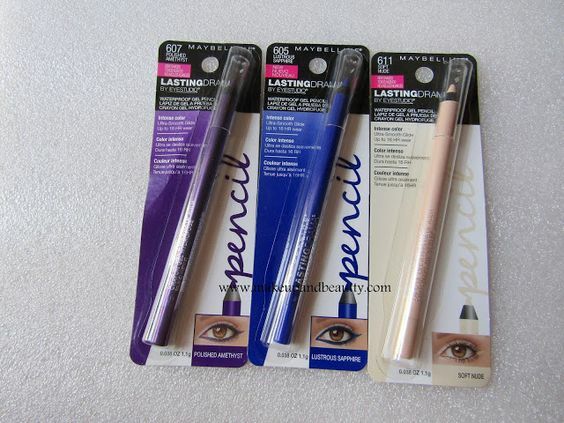 As everybody is different and so the choices are ...so what are your favorite product from Maybelline?